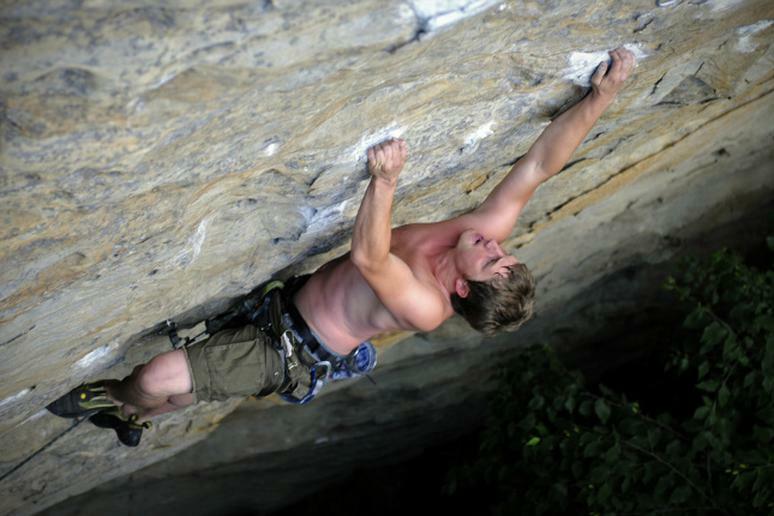 A climber in the Red River Gorge, Kentucky. Awarding anything the superlative of “toughest” is generally a tough call, but when it comes to rock climbing routes in America, there’s some standardization in the form of the Yosemite Decimal System. The fifth class of the YDS classifies rock climbing—the other classes deal with walking, hiking, and scrambling of varying degrees—and is continuously being altered as climbing’s figurative ceiling is raised every year. Fifty years ago, the most difficult climb in America was a 5.9. Now, after the YDS’s subdivision above the 5.9 mark with suffixes from “a” to “d,” it’s a 5.15b—and 5.9 is a cakewalk for professional climbers. Deriving its name from the two routes on which it starts (Ghetto Boys, 5.13c) and finishes (Infectious Booty, 5.14b), Ghetto Booty was ascended for the second time ever in May 2011 by Mexico’s Mauricio Huerta. Its first ascent was more than a decade earlier—unsurprising considering the difficulty of the route, chock-full of two-finger holds and one-finger underclings. Professional climber Daniel Woods, the first (and only) person to send Mourning Glory, mentioned on his Facebook page that at the base of the roof “you are 250 feet above [Clear Creek], completely exposed.” Oh. “It was like trying to sell three Kirbys in a week,” said Joe Kinder of Livin’ Astroglide’s difficulty. For reference, “Kirbys” are ridiculously expensive vacuum cleaners that Kinder attempted—and failed—to sell after earning a not-so-lucrative art degree. “I sold, like, two in three weeks, to people I knew,” he said. Previously known as the “Natural Law” project, the route was sent for the first time, on June 25, by Ethan Pringle (great name, even better climber). “It was one of the most fun-to-climb-on routes I’ve ever done,” he exclaimed on his website, with “huge and gymnastic” moves and a “stunning” line. Pringle named the route after one of his favorite TV shows, which “sort of fits with the theme of the cliff,” he said. Ascended by just four climbers—Matty Hong, Jonathan Siegrist, Joe Kinder and, most recently, Jon Cardwell—the 100-foot Bad Girls Club is the toughest climb in Rifle, Colorado’s premier climbing destination. “It’s one of those walls where people are like, ‘There’s no holds, there’s no holds, there’s no holds!’” Kinder said in an interview with Climberism. Sasha DiGiulian became the first American woman to climb a 5.14d when she sent Pure Imagination (in just six tries) in October 2011. Rock and Ice named this feat number six on their list of the top ascents of 2011. This route is so difficult, Sportiva-sponsored climber Jonathan Siegrist mentioned it as a climb he once only dreamed about, the route he hoped, loftily, would be his first 5.14d. After achieving his goal of sending Kryptonite in September 2010, Siegrist devoted an entire blog post to the route, describing the climb so fervently that—if not for the climbing lingo—you’d think he was recounting a religious rite of passage. Daniel Woods spent a week working on this route before finally redpointing it—climbing with ropes that would only prevent falls, not aid upward progress—on May 8, and no one’s climbed it in the months since. Woods called it the hardest sport climb he’s ever done. Flex Luthor, a 120-foot, steep overhanging line, was the first 5.15-grade climb in the United States. Tommy Caldwell redpointed the route in 2003 and said it was significantly harder than Kryptonite, located just 100 feet to the left at the Fortress of Solitude. It took Mike Foley countless tries over a two-week period to successfully send Jaws II, “certainly the hardest thing I’ve ever done,” he said in an interview with Climberism. The original Southern Smoke begins with a relatively easy climb over a slab to the right of an overhanging wall—and it’s still rated a nigh-impossible 5.14c. Southern Smoke Direct, meanwhile, begins from the ground, starting with a hard boulder problem that saps your energy before you even get to the real climbing, according to Adam Taylor, the route’s first ascender. Many have tried. All have failed (see video below). All, that is, but Chris Sharma, who sent Jumbo Love, the only 5.15b climb in America, in 2008. Sharma has called it the most difficult ascent of his life—no small distinction coming from arguably the most accomplished American climber of all time. Is the 250-foot Jumbo Love, then, the most difficult climbing route in the United States of America? Yes.